For information on using the Workbench softwre, you can also check out the Variax Workbench User's Guide. Q: What is the Variax Workbench software? A: Variax Workbench software is an Editor/Librarian for the Variax 300/500/600/700 and James Tyler Variax Electric guitars, as well as the Variax 700 Acoustic guitar. This program can be used to edit and manage the guitar models in your Variax guitar. ***Please note, that the ALT TUNING knob presets of the James Tyler Variax guitars are NOT accessible through the current version of the Variax Workbench software (v1.73 as of this writing). Q: Can I use the Variax Workbench software to edit my Variax 300 acoustic or Variax 700/705 Bass instrument? A: No, the Variax 300 acoustic guitars do not have a Variax Digital Interface (VDI) jack, and the Variax 700/705 Bass instruments are not supported for Variax Workbench. Q: What Line 6 interface will I need to connect my compatible Variax instrument to my computer to use Variax Workbench? A: You will need one of the following devices to connect your compatible Variax instrument to your computer: PODxt Live, POD X3 Live/Pro, POD HD500, POD HD Pro,Vetta I (equipped with the VDI interface), Vetta II, or the Workbench USB Interface. Q: Can I use the Workbench software on a 64 bit operating system? A: Yes all of our software drivers are compatible on 64-bit operating systems. Q: Do I need to use the XPS box to power my guitar when using the Workbench interface or does the Workbench interface power my Variax? A: The Variax still requires power from the XPS footswitch when using the Workbench interface to connect to your computer. However, you will not need the XPS box if you are using a PODxt Live, X3 series, POD HD500, or Vetta series unit to interface with your computer. Q: Why can't I hear audio though my computer while I have my Variax plugged in through the Workbench device? A: The Workbench USB device is not an audio interface, but merely a USB interface to allow your Variax to talk to your computer. In order to hear your Variax, you will need to have it connected to an amp or other monitoring system. Q: With the Workbench package, will I be able to download new sounds into my Variax guitar? For instance, can I get the nylon string sound from your Variax acoustic into my Variax 300/500/700 or vice versa? A: The Workbench software only allows you to edit what is already in the guitar, thereby creating custom guitars internally. You will not be able to install new guitar models into your Variax. Q: What is the maximum I can pitch shift the sympathetic (12 string) strings in Workbench? A: On the 12 string models, you can pitch shift the sympathetic strings by one octave in either direction. Please note- when using the 'detune' option for the sympathetic strings, if you raise the tuning by the full octave you cannot detune the strings any higher than a full octave. Q: Does the Workbench package come with the Digital Variax cable included, or would I have to purchase that separately? A: The Workbench package comes with a 10 foot Digital Variax cable included. This cable is not designed for live use as the longer Variax digital cable is, since it only has the reinforced, hooded connection on one end, rather than both. The 25' version is available separately either through our online store or through any Line 6 dealer. Q: I've changed one of my models to an alternate tuning and when I switch away from it and back, I get the old model for a few seconds before my new one kicks in. What's going on? A: Until you save your edited model, it has to load into the edit buffer from the swap buffer when you first access the switch. Since it's not yet stored in the guitar, it can take a moment. Take a sip of coffee, and you're golden. Q: I have the same model in two different banks. If I try and drag them both to the File Browser it works, but if I try one at a time, it asks me if I want to overwrite the patch? A: If you drag two models with the same name from the Device Browser to the File Browser at the same time, one of them will get a number added to the end to differentiate it from the other patch (actually this will work with more than two models as well). If you try and drag them over one at a time, Workbench can't tell that they're not the same model (since a drag to the File Browser doesn't carry memory location information along with it), so will assume that you're trying to replace an existing model with an edited version of the same model. The solution? Use unique model names. Q: I just saved a model that I edited from a bundle (or collection) back to that bundle and I'm still getting prompted to save when I close the editor? A: If you closed the bundle (or collection), you severed the tie between that bundle and the edited model. Workbench no longer knows what bundle it came from, only that it has an edited model in memory. If you're absolutely positive you saved it already, just click on "Don't Save". If you have any doubt, click on Save, and it will just save it as a single model in your default Workbench directory. Q: I can't see the bottom of the Editor or Tone Locker windows? A: Workbench needs a screen resolution of 1024x768. While you can flip between two sizes in the Tone Locker (that's what the little triangle in the lower right-hand corner is for), the Editor Window is a fixed size and will go off the bottom of the screen at lower resolutions. For just a little extra room, you can use the Autohide task bar feature on Windows (right-click in the unused portion of the task bar and select Properties) or hiding the Dock on a Mac OS X.
Q: Can I adjust individual string volumes? A: Yes. When you open the Editor screen in the Workbench Software, under the "Editor" menu, you'll see a choice for "String Volume Setup" at the bottom of the menu. This brings up a group of 6 sliders to set the balance between strings. Remember that these are global settings (not per patch), so that changing the balance will affect all of your different models. 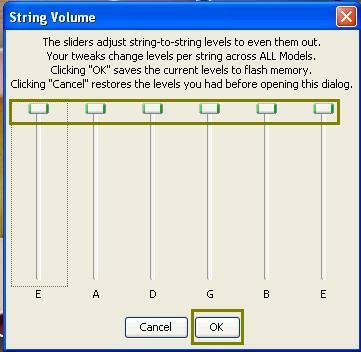 Select "OK" once you have changed the strings to the desired levels. As a side note, it's normal for many guitars to have volumes that differ from string to string. One example of this would be guitars with combination of a fairly small fretboard radius and pickups with non-staggered pole pieces. It can also happen with guitars that have peaks in body resonance at or near the fundamental or one of the lower harmonics of a specific note. Q: What is the "Live" & "Studio" switch in Workbench for when using a Variax Acoustic 700? A: The live mode removes the room reflections from the guitar output. Q: I am getting strange text characters in my title? A: On the Macintosh, Option-1 and Option 2 are keystrokes for special characters. Since this functionality is built into the font designs, we can't turn it off. This will only happen if you have an insert point selected in one of the text fields, though, so you can easily work around it by clicking one of the the body, pickup or tone control select drop-downs (depending on which tab of Workbench you're using) to remove the insert point from the text field. Drag and drop may be a little bit different than what you're used to, as Java (the programming language in which Workbench is written) uses its own protocols for this. We'll try and spell out the differences here. 1. When in the Device Browser window of the Tone Locker, dragging one model to a different location will swap the two (ex. dragging Spank 1 over Spank 3 will swap their positions on the 5-way switch. Dragging Lester 2 over Special 4 will swap their positions on the Select knob and on the 5 way switch). 2. If you don't drop a model directly on top of another model in the Device Browser, but between two models instead, it will insert itself between the two, and slide everything else down one. when this happens all of the 'slid' models will show as editied (have the yellow exclamation mark next to them). If you really want this arrangement, be sure to performa a Sync and choose the "Write Selected Models..." option or your changes can get lost in the shuffle (sorry, couldn't resist the pun). Note: this only works in a bank. You can't insert a model from a different bank, although you can use the swap feature to move a model from one bank to another. 3. Dragging multiple selections from the Device Browser to a collection or bundle in the File Browser will behave differently depending on how the models were selected. A "shift-click" selection process will drop the models in the order in which they are in Memory. "Ctrl-click" (or "Command-click" on the Mac) to make a multiple discontinuous selection will drop them in the order in which they were selected. For example, if you Ctrl (or Command)-clicked on Spank 1, Spank 3, Lester 4, Reso 3, and then came back and selected Lester 2, they would copy to the collection or bundle in that exact order and not the order in which they appear in the Device Browser. 4. Dropping a model from a bank onto that bank name will place that model at the last (5) switch position and move everything above it up one. Q: Will the Variax Workbench graphics change with left-handed Variax? A: The strings appear on-screen the same as for a right handed guitar, the graphics will not be reversed. In other words, the high E string on the physical guitar will correspond to the high E string on-screen. Q: What are all the terms I hear about using Line 6 Workbench? A: To help you through the navigation of Variax and Workbench, please see the following short glossary. Bundle: A saved dump of the entire memory contents of a Variax. This includes all models as well as the bank and switch combination at which they're stored. Collection: A saved group of models. Collections can be of any size and contain internal folders for organization. Models stored in Collections do not include switch/bank information. Q: What's the difference between a bundle and a collection? A bundle is always a dump of the complete user memory contents of a Variax. This includes which memory (or switch if you want to think of it in more traditional guitar terms) position is used for each model. It will always have exactly 12 banks of 5 models each for a total of 60 models. If you wanted to quickly clone your Variax into a friend's, you'd use the Get Bundle button on your guitar, then hook up your friend' guitar and use the Send Bundle button to create a duplicate of your guitar. A collection is just exactly that - a collection of models all stored together. It could be a single model (although that would be a little silly), two models, or thousands of models. Inside a collection, tones can be arranged in folders, so you could put all of your models that use alternate tunings in one folder, or all the different variations on the T-Model body that you created into a single folder. A collection can have as many different folders as you'd like (although you can't nest folders or put a folder inside another folder in a collection). This is a great way to categorize a lot of models if you were, for instance, going to email them to a friend halfway around the world. Edit Buffer: The area in the Variax memory where a model is loaded when you select it from the guitar or double click on it in either one of the browsers. When you're editing a model in Workbench, you're working on a copy of what's stored in the guitar. This means that if you decide that you don't like what you've done, you can back out gracefully without having overwritten what's stored in the guitar. It also means that if you like what you've done, you need to remember to save it. Edit Window: Where the magic happens. In this window, you select body, pickup, tone/volume control, and tuning to build an individual Variax model. The Edit window has three tabs (Body, Pickup, Controls), a tuning section at the bottom, and a graphic representation of the guitar where you can do things like grab one of the pickups, slide it around, or rotate it. File Browser: The left panel of the Tone Locker window. This displays all the models, collections, and bundles that you have stored in your Workbench directory (or whatever directory you've navigated to). Model: A particular combination of body, pickups, tone controls, and (possibly) tuning. Swap Buffer: This loads the model in the guitar that you started from when editing. It's there so you can A/B between what you started with and what you've got. A good way to tell if you're on the right track, or if you need to start over. By the way, when you save a model, it's the currently displayed model is saved, so make sure you're looking at the right one before you hit that Save button. Sync: This button allows you to make sure that what the Device Browser shows and what's in the memory of your Variax are the same. It also gives you the option to go back to your saved user models.. Tone Locker: This window contains both browsers (File and Device) and is where you go to to file management, model organization, and shuffle models around in memory. Q: I am experiencing MIDI timeouts and/or connection error when I launch Workbench. How can I resolve this? 1) Close Line 6 Monkey prior to opening Line 6 Workbench. Line 6 Monkey Installation and F.A.Q. 3) Remove all non-essential USB devices from your computer, and connect your Line 6 interface device directly to the back of the computer. If you are using a laptop, try multiple USB ports to see if a different port has a better USB connection. 4) Try a different Variax and USB cable, as well as a different Line 6 device to see if there is a hardware problem with the amplifier. Q: I am receiving a "Java Error" when I try to launch Workbench? â€¢ Using the X3 hardware to change models can cause the software and hardware to get out of sync. Please use either Variax Workbench software or the Variax itself for model and parameter selection. â€¢ Disconnecting USB when launching or running Workbench can cause the program to hang, or cause trouble quitting the program. Please quit Workbench before disconnecting the USB cable. â€¢ Hot swapping Variax guitars when Workbench is running may cause loss of communication. Please quit Workbench, then swap guitars, then re-launch the program. â€¢ Operating the X3 Live while launching Workbench (changing presets, turning the Select knob, etc.) can cause a MIDI timeout error. Please allow Workbench to completely launch before editing the POD X3 Live. Pour les informations supplÃ©mentaires, visitez Variax Workbench User's Guide. Qu'est-ce que le logiciel Variax Workbench? Le logiciel Variax Workbench est un Ã©diteur et bibliothÃ©caire pour les Variax 300/500/600/700, les guitares James Tyler Variax Electric et la guitare Variax 700 Acoustique. Ce logiciel peut-Ãªtre utilisÃ© pour Ã©diter et gÃ©rer les modÃ¨les guitares dans votre guitare Variax. Attention, les presets du bouton ALT TUNING de la James Tyler Variax ne sont pas accessibles avec la version actuelle de Variax Workbench (1.73 au moment de cette publication). Est-ce que je peux utiliser le logiciel Variax Workbench pour Ã©diter ma Variax 300 acoustique ou Variax 700/705 Bass? Non, la Variax 300 acoustique n'a pas un jack Variax Digital Interface (VDI) et la 700/705 Bass ne sont pas prises en charge de Variax Workbench. Quelle interface Line 6 aurai-je besoin pour connecter ma guitare Variax compatible avec mon ordinateur pour l'utiliser avec Variax Workbench? Vous avec besoin d'un des appareils suivants pour connecter votre instrument Variax compatible avec votre ordinateur: PODxt Live, POD X3 Live/Pro, POD HD500, POD HD Pro, Vetta I (avec interface VDI), Vetta II ou l'interface Workbench USB. Est-ce que je peux utiliser le logiciel Workbench sur mon systÃ¨me d'exploitation 64 bits? Oui, tous les pilotes et logiciel de Line 6 sont compatibles avec les systÃ¨mes d'exploitation 64 bits. Est-ce que j'ai besoin d'utiliser le XPS Box pour allumer ma guitare si j'utiliser l'interface Workbench ou est-ce que l'interface Workbench allume ma Variax? La Variax doit toujours Ãªtre allumÃ© par le commutateur au pied XPS si vous utilisez l'interface Workbench comme connexion Ã l'ordinateur mais si vous utilisez un des interfaces suivants, vous n'avez pas besoin du XPS: PODxt Live, sÃ©rie X3, POD HD500 ou la sÃ©rie Vetta. Pourquoi est-ce que je ne peux pas entendre du audio de mon ordinateur si ma Variax est connectÃ©? L'interface Workbench USB n'est pas une interface Audio mais simplement une interface USB pour permettre Ã votre Variax de parler Ã votre ordinateur. Pour entendre la Variax, vous avez besoin de la connecter Ã un ampli ou autre systÃ¨me monitoring. Avec le pack Workbench, est-ce que je peux tÃ©lÃ©charger des nouveaux sons dans ma guitare? Par exemple, est-ce que je peux avoir le son Nylon String de la Variax acoustique dans ma Variax 300/500/700 ou vice versa? Le logiciel Workbench vous permet seulement d'Ã©diter ce qui est dÃ©jÃ sur la guitare. Vous ne pouvez pas installer des nouveaux modÃ¨les des guitares dans votre Variax. Quel est le maximum de dÃ©calage de hauteur des cordes sympathiques ("Sympathic Strings") dans Workbench? Sur les 12 modÃ¨les cordes, vous pouvez changer la tonalitÃ© des cordes sympathiques d'une octave dans les deux sens. Attention, si vous utilisez l'option "detune" pour les cordes sympathiques et vous augmentez la tonalitÃ© d'une octave, vous ne pouvez plus "detune" les cordes plus haut qu'une octave. Est-ce que le paquet Workbench a le cÃ¢ble numÃ©rique Variax inclus ou dois-je l'acheter sÃ©parÃ©ment? Le pack Workbench a un cÃ¢ble "Variax Digital" de 3 mÃ¨tres inclus. Ce cÃ¢ble n'est pas dÃ©signÃ© pour l'utilisation en scÃ¨ne contrairement au cÃ¢ble numÃ©rique Variax plus long. Ce cÃ¢ble a une connexion renforcÃ© et encapuchonnÃ© seulement pour une extrÃ©mitÃ©. La version 7,5 mÃ¨tres est disponible sÃ©parÃ©ment dans notre boutique en ligne et via les distributeurs Line 6. J'ai changÃ© un de mes modÃ¨les et si je bascule loin de ce modÃ¨le et reviens, je reÃ§ois le vieux modÃ¨le pour quelques secondes avant que mon nouveau modÃ¨le s'active. Que se passe-t-il? Avant que vous ayez enregistrez le modÃ¨le Ã©ditÃ©, le modÃ¨le s'enregistre dans le buffer d'Ã©diteur du swap buffer si vous accÃ©dez le bouton pour la premiÃ¨re fois. Puisque ce modÃ¨le n'est pas encore enregistrÃ© dans la guitare, ca peut prendre un moment. J'ai le mÃªme modÃ¨le dans deux emplacements. Si je prends les deux dans le "File Browser", ca fonctionne mais si je prends un Ã la fois, il dit "overwrite the patch". Que se passe-t-il? Si vous mettez deux modÃ¨les avec le mÃªme nom du Device Browser dans le File Browser, un des deux sera renommÃ©, il reÃ§oit un nombre Ã la fin pour le diffÃ©rencier d'autre patch (ca fonctionne avec plusieurs patchs Ã©galement.). Si vous glissez seulement un patch en mÃªme temps, Workbench ne sait pas que les deux ne sont pas les mÃªmes donc Workbench prÃ©sume que vous voulez remplacer un modÃ¨le existant avec une version Ã©ditÃ© du mÃªme modÃ¨le. Solution: Utilisez des noms uniques. J'ai enregistrÃ© un modÃ¨le que j'ai Ã©ditÃ© d'un bundle (ou collection) de nouveau dans le bundle mais je suis toujours invitÃ© Ã enregistrer quand je ferme l'Ã©diteur. Que se passe-t-il? Si vous avez fermez le bundle, vous avez coupÃ© la liaison entre le bundle et le modÃ¨le Ã©ditÃ©. Workbench ne sait plus de quel bundle, ce modÃ¨le vient. Si vous Ãªtes sÃ»r que vous avez dÃ©jÃ enregistrÃ© ce modÃ¨le, cliquez "Don't Save". Si vous n'Ãªtes pas sÃ»r, cliquez "Save" et il l'enregistre comme modÃ¨le individuel dans le rÃ©pertoire de dÃ©faut de Workbench. Je ne peux pas voir le fond des fenÃªtres Editor et ToneLocker. Que se passe-t-il? Workbench a besoin d'une rÃ©solution de 1024x768. Pendant que vous pouvez basculer entre deux tailles pour le Tone Locker (le petit triangle dans le coin en bas Ã droite), la fenÃªtre Editor est fixÃ©e et ne correspond plus Ã la fenÃªtre aux rÃ©solutions baisses. Pour un peut plus de place, vous pouvez utiliser la fonction masquer automatiquement de la barre des tÃ¢ches de Windows (clic droit sur la barre des tÃ¢ches -> propriÃ©tÃ©s) ou masquer le Dock de Max OS X.
Est-ce que je peux ajuster les volumes des cordes? Oui, si vous ouvrez la fenÃªtre "Editor" dans le logiciel Workbench, vous pouvez voir "String Volume Setup" Ã la partie infÃ©rieure du menu. Cette option affiche un groupe de 6 curseurs pour balancer les cordes. Attention, ce sont des options globales (pas par patch) donc changer ce rÃ©glage affectera tous les modÃ¨les. Cliquez "OK" si vous avez changÃ© les cordes. Notez que pour beaucoup de guitares, c'est normal d'avoir des volumes qui diffÃ¨rent d'une corde Ã une autre. Ca peut aussi arriver avec les guitares qui ont des sommets en rÃ©sonance du corps prÃ¨s du fondamental ou un des harmoniques baisses d'une note spÃ©cifique. Ã€ quoi serrent les boutons "Live" et "Studio" en Workbench si j'utilise une Variax Acoustic 700? Le mode "Live" enlÃ¨ve les rÃ©flexions de chambre du la sortie guitare. Je reÃ§ois des bizarres caractÃ¨res de texte dans le titre. Que se passe-t-il? Sur le Macintosh, Option-1 et Option-2 sont des touches pour caractÃ¨res spÃ©ciaux. Parce-que cette fonction est intÃ©grÃ©e dans le design des polices de caractÃ¨res, nous ne pouvons pas l'Ã©teindre. Ca se passe seulement si vous avez sÃ©lectez un point d'insertion pour un des zones de texte donc vous pouvez cliquer "body", "pickup" ou "tone" (selon l'onglet de Workbench vous utilisez) dans le menu pour enlever le point d'insertion de la zone de texte. Si vous ne placez pas un modÃ¨le sur un autre, mais vous le placez entre deux modÃ¨les, le modÃ¨le s'insÃ¨re entre les deux et glissiÃ¨re tout le reste une place vers le bas. Tous les modÃ¨les glissÃ©s s'affichent comme Ã©ditÃ© (point d'exclamation jaune). Si vous voulez souvenir cet arrangement, effectuez une synchronisation et cliquez "Write Selected Modelsâ€¦". Attention, Ca fonctionne seulement dans un vide. Vous ne pouvez pas insÃ©rer un modÃ¨le d'un emplacement (bank) diffÃ©rent mais vous pouvez utiliser la fonction "swap" pour glisser un modÃ¨le d'une berge Ã une autre. Si vous glissez plusieurs sÃ©lections du Device Browser dans une collection ou bundle, le File Browser se comporte diffÃ©remment dÃ©pendant Ã comment vous avez sÃ©lectÃ© les modÃ¨les. Une sÃ©lection "shift-clic" (ou "command-clic" pour Mac) les dÃ©pose dans l'ordre dans la mÃ©moire. Si vous sÃ©lectionnez avec "Ctrl-clic", ca les dÃ©pose dans l'ordre de sÃ©lection. Par exemple, si vous Ctrl-sÃ©lectez Spank 1, Spank 3, Lester 4 et Reso 3 et revenez pour sÃ©lecter Lester 2, le logiciel les copie dans cette ordre et pas dans l'ordre comme ils sont affichÃ©s dans le Device Browser. Si vous glissez un modÃ¨le d'un "bank" sur le nom du "bank" le modÃ¨le se place sur la derniÃ¨re (5) position et dÃ©placera tous un vers le haut. Est-ce que les graphiques de la Variax Workbench changent avec une Variax pour gaucher? Les cordes apparaissent sur l'Ã©cran comme avec une guitare pour droitier. Les graphiques ne changent pas. La corde E sur la guitare correspond Ã la corde E sur l'Ã©cran. Bundle: Un dÃ©pÃ´t enregistrÃ© de tous le contenu mÃ©moire d'une Variax. Ceci inclus tous les modÃ¨les aussi bien que les berges (bank) et les combinaisons switch comme stockÃ©. Collection: Un groupe de modÃ¨les enregistrÃ©. Les collections peuvent-Ãªtre de n'importe quelle taille et ont des dossiers internes pour organisation. Les modÃ¨les stockÃ©s dans Collections n'inclurent pas les informations Switch/Bank. Quel est la diffÃ©rence entre Bundle et Collection? Un Bundle est toujours un dÃ©pÃ´t enregistrÃ© de tous le contenu de la mÃ©moire d'une Variax. Ceci inclus les positions memory est utilisÃ© pour chaque modÃ¨le. Il a toujours 12 berges avec 5 modÃ¨les chacun donc 60 modÃ¨les en tous. Si vous voulez cloner votre Variax sur une autre, vous cliquez le bouton "Get Bundle", connectez l'autre guitare et cliquez "Send Bundle". Une Collection est une collection de modÃ¨les enregistrÃ©s ensembles. 1, 2 ou 1000 modÃ¨les. Dans une collection, les tons peuvent-Ãªtre arrangÃ©s en dossiers pour organiser vos modÃ¨les. Une collection peut avoir un nombre infini de dossiers (vous ne pouvez pas mettre un dossier dans un autre.). C'est une excellente faÃ§on de catÃ©goriser un grand nombre de modÃ¨les. Edit Buffer: Est la rÃ©gion de mÃ©moire de la Variax oÃ¹ le modÃ¨le est chargÃ© si vous le sÃ©lectez de la guitare ou le sÃ©lectez avec un double-clique dans un des navigateurs. Si vous Ã©ditÃ©s un modÃ¨le dans votre Workbench, vos travaillez sur une copie. Ca veut dire que si vous ne voulez pas enregistrer que vous avez faits, vous pouvez l'annuler et rien n'est Ã©crasÃ©. Mais ca veut Ã©galement dire que si vous voulez maintenir ce que vous avez faits, vous devez l'enregistrer. Edit Window: Ici, vous sÃ©lectez "body", "pickup", "tone" et "volume" et rÃ©glez-les pour crÃ©er un modÃ¨le Variax individuel. Cette fenÃªtre a trois onglets (Body, Pickup, Controls), une section de rÃ©glage en bas et une reprÃ©sentation graphique de la guitare oÃ¹ vous pouvez faire des choses comme prendre une des micros, faites-le glisser autour, ou le faire pivoter. Device Browser: Le panneau droit de la fenÃªtre Tone Locker. Ceci affiche le contenu de la mÃ©moire Variax, y inclus les modÃ¨les que vous avez Ã©ditÃ© et pas encore enregistrÃ©. Model: Une combinaison particuliÃ¨re de body, pickups, contrÃ´leurs de tons et tuning. Swap Buffer: Ceci charge le modÃ¨le dans la guitare que vous avez commencÃ© lors de l'Ã©dition. Il est lÃ pour que vous puissiez Ã©changer entre ce que vous avez commencÃ© et ce que vous avez. Attention, si vous enregistrÃ©s un modÃ¨le, le logiciel enregistre toujours le modÃ¨le affichÃ©, donc vÃ©rifiez que c'est le correcte modÃ¨le qui est affichÃ© avant que vous poussez le bouton Save. Sync: Ce bouton permet de synchroniser l'affichage du Device Browser avec ce que vous avez dans la mÃ©moire de la Variax. Et il vous donne la possibilitÃ© de retourner aux modÃ¨les enregistrÃ©s. Tone Locker: Cette fenÃªtre contient les deux Browsers (File et Device) et est dans l'endroit de la gestion des fichiers, l'organisation de modÃ¨les et le "shuffle modÃ¨le". Je rencontre des dÃ©lais d'attente MIDI et / ou erreur de connexion lorsque je lance Workbench. Comment puis-je rÃ©soudre ce problÃ¨me? Fermez Line 6 Monkey avant que vous dÃ©marrez Workbench. DÃ©branchez tous les appareils USB inutiles de votre ordinateur et connectez votre interface Line 6 directement dans l'arriÃ¨re de l'ordinateur. Si vous utilisez un portable, essayez tous les ports USB. Essayez un cÃ¢ble Variax et USB diffÃ©rent aussi bien qu'une autre interface Line 6 pour voir s'il y en a un problÃ¨me avec l'ampli. Je reÃ§ois une erreur "Java Error" si j'essaye de lancer Workbench, Comment puis-je rÃ©soudre ce problÃ¨me? Cette version contient un correctif pour une compatibilitÃ© Java qui a le potentiel d'affecter certaines configurations OS / hardware. En utilisant le matÃ©riel X3 pour changer les modÃ¨les peut causer le logiciel et le matÃ©riel de dÃ©synchroniser. Veuillez utiliser le logiciel Variax Workbench ou la Variax lui-mÃªme pour la sÃ©lection du modÃ¨le et des paramÃ¨tres. DÃ©connexion USB lors du lancement ou l'exÃ©cution Workbench peut provoquer le programme de planter ou poser des problÃ¨mes qui quittent le programme. Veuillez arrÃªter Workbench avant de dÃ©brancher le cÃ¢ble USB. Le remplacement des guitares Variax pendant que Workbench est en cours d'exÃ©cution peut entraÃ®ner une perte de communication. Veuillez quitter Workbench, Ã©changer les guitares, puis relancer le programme. Utilisation du X3 Live en lanÃ§ant Workbench (changement presets, tourner le bouton Select, etc.) peut entraÃ®ner une erreur de dÃ©lai MIDI. Veuillez laisser lancer Workbench complÃ¨tement avant de modifier le POD X3 Live. Die Variax Workbench Software ist gleichzeitig Editor und Verwalter fÃ¼r Ihre Variax 300/500/600/700 und James Tyler Variax Electric Gitarren sowie fÃ¼r die Variax 700 Acoustic. Dieses Programm kann zur Bearbeitung und Verwaltung Ihrer Gitarrenmodelle in Ihrer Variax Gitarre genutzt werden. Achtung, die Presets des ALT TUNING Knopfes Ihrer James Tyler Variax Gitarre sind Ã¼ber die derzeitige Workbench Version nicht zugÃ¤nglich (v1.73 zum Zeitpunkt dieses Schreibens). Kann ich die Variax Workbench Software zur Bearbeitung meiner Variax 300 Acoustic oder Variax 700/705 Bass benutzen? Nein, die Variax 300 Acoustic haben keine digitale Variax Schnittstelle (VDI) und die Variax 700/705 Bass Instrumente werden nicht von Workbench unterstÃ¼tzt. Welche Line 6 Schnittstelle brauche ich um meine kompatible Variax Gitarre mit dem Computer zu verbinden? Dazu brauchen Sie eines der folgenden GerÃ¤te: PODxt Live, POD X3 Live/Pro, POD HD500, POD HD Pro, Vetta I (mit VDI Schnittstelle), Vetta II oder das Workbench USB Interface. Kann ich die Workbench Software auf einem 64 Bit System verwenden? Ja, alle Line 6 Software und Treiber sind kompatibel mit 64 Bit Betriebssytemen. Muss ich die XPS Box benutzen um meine Gitarre zu betreiben wenn ich das Workbench Interface benutze oder betreibt dieses meine Gitarre? Die Variax braucht immernoch Strom von dem XPS FuÃŸschalter wenn Sie die Workbench Schnittstelle benutzen um es mit Ihrem Computer zu verbinden. Sollten Sie aber ein PODxt Live, X3, POD HD500 oder Vetta GerÃ¤t verwenden brauchen Sie keine XPS Box. Wieso kann ich keinen Sound vie Computer hÃ¶ren wÃ¤hrend meine Gitarre an den Computer angeschlossen ist? Das Workbench USB GerÃ¤t ist keine Audio-Schnittstelle sondern nur ein USB GerÃ¤t um die Kommunikation zwischen Gitarre und Computer zu ermÃ¶glichen. Um Ihre Gitarre zu hÃ¶ren mÃ¼ssen Sie einen VerstÃ¤rker oder Monitoring GerÃ¤t anschlieÃŸen. Kann ich mit dem Workbench Paket neue TÃ¶ne fÃ¼r meine Variax herunterladen? Kann ich so z.B. den Nylon Saiten-Ton von der Variax Acoustic auf meine Variax 300/500/700 oder andersherum aufspielen? Die Workbench Software erlaubt Ihnen nur zu bearbeiten, was bereits auf dem Gitarre ist. Sie kÃ¶nnen also keine zusÃ¤tzlichen Modelle installieren. Wie weit kann ich die TonhÃ¶he der Resonanzsaiten in Workbench verschieben? Auf den 12 Saitenmodellen kÃ¶nnen Sie die Resonanzsaiten eine Oktave in beide Richtungen verschieben. Achtung, wenn Sie die "Detune" Option fÃ¼r die Resonanzsaiten verwenden kÃ¶nnen Sie, wenn Sie die auf eine volle Oktave verschieben, die Detune Funktion nur maximal ulm eine Oktave verÃ¤ndern. Hat das Workbench Paket ein digitales Variax Kabel mit enthalten oder muss ich es separat kaufen? Im Workbench Paket ist ein 3 Meter VD (Variax Digital) Kabel enthalten. Das Kabel ist jedoch nicht fÃ¼r die Live Nutzung gedacht im Gegensatz zum langen Kabel, da es nur ein Ende verstÃ¤rkt und abgeschirmt hat. Die 7.5 Meter Version ist separat erhÃ¤ltlich via Webshop oder Line 6 HÃ¤ndler. Ich habe eines der Modelle abgeÃ¤ndert und wenn ich nun wegschalte und wieder zurÃ¼ck dann bekomme ich erst fÃ¼r ein paar Sekunden das alte Modell bevor mein neues eintritt. Was ist hier das Problem? Bis dass Sie Ihr neues Modell abgespeichert haben wird es aus dem Swap- in den EditBuffer geladen wenn Sie den Knopf verwenden. Da das Modell noch nicht auf der Gitarre abgespeichert ist kann dies einen Moment dauern. Ich habe das selbe Modell in zwei verschiedenen Banken. Wenn ich versuche beide in den File Browser zu ziehen funktioniert das auch aber wenn ich einen einzeln versuche stell Workbench mir die Frage ob ich das Patch Ã¼berschreiben will. Was ist hier das Problem? Wenn Sie zwei Modelle mit dem selben Namen zur gleichen Zeit aus dem Device Browser in den File Browser ziehen wird eines der Beiden eine Zahl ans Ende gehangen bekommen um beide zu unterscheiden (eigentlich funktioniert dies sogar mit mehr als 2 Modellen.). Wenn Sie aber versuchen eines einzeln auf die andere Seite zu ziehen weiÃŸ Workbench nicht dass es nicht die selben Modelle sind und nimmt somit an, dass Sie versuchen ein existierendes Modell mitder verÃ¤nderten Version zu Ã¼berschreiben. LÃ¶sung: Benutzen Sie einfach einzigartige Modell-Namen. Ich habe gerade ein Modell, welches ich bearbeitet habe, aus einem Bundle (oder Collection) zurÃ¼ck in das Bundle gespeichert und bekomme trotzdem ein Fenster zum Abspeichern wenn ich den Editor schlieÃŸe. Warum? Wenn Sie das Bundle (oder Collection) geschlossen haben, dann haben Sie die Verbindung zwischen dem Bundle und dem Modell getrennt. Workbench weiÃŸ jetzt nicht mehr von welchem Bundle das Modell kam sondern nur, dass es verÃ¤ndert wurde. Wenn Sie sich aber absolut sicher sind, dass Sie es abgespeichert haben, dann kÃ¶nnen Sie "Don't Save" klicken. Wenn Sie aber zweifeln, dann kÃ¶nnen Sie auch einfach "Save" klicken, was dann das Modell als einzelnes Modell im der Workbench Verzeichnis nocheinmal abspeichert. Ich kann das untere Ende des Editor oder Tone Port Fensters nicht sehen. Weshalb? Workbench braucht eine BildschirmauflÃ¶sung von 1024x768. WÃ¤hrend Sie im Tone Port zwischen zwei GrÃ¶ÃŸen wechseln kÃ¶nnen (das kleine Dreieck in der unteren rechten Ecke des Fensters), hat der Editor eine feste GrÃ¶ÃŸe und wird somit bei Bildschirmen mit geringen AuflÃ¶sungen am unteren Ende abgeschnitten. FÃ¼r ein wenig mehr Platz kÃ¶nnen Sie das automatische Ausblenden der Task Leiste bei Windows anschalten (rechtsklick auf die Task Leiste -> Einstellungen) oder bei Mac OS X das Dock ausblenden. Kann ich individuelle SaitenlautstÃ¤rken verÃ¤ndern? Ja, wenn Sie das Editor Fenster in Workbench Ã¶ffnen, kÃ¶nnen Sie unter dem "Editor" Menu eine Auswahl sehen: "String Volume Setup". Die Ã¶ffnet eine Gruppe von 6 Schiebreglern um die Balance zwischen den Saiten einzustellen. Achtung, dies sind globale Einstellungen, was bedeutet, dass diese Einstellung alle Modelle vetrifft und nicht nur dieses einzelne Patch. Klicken Sie dann "OK". Achtung, bei manchen Gitarren ist es normal, dess die LaustÃ¤rken der verschiedenen Saiten unterschiedlich sind. So kann dies zum Beispiel bei manchen Gitarren, die eine Spitze in der Korpusresonanz in der NÃ¤he der Grundfrequenz oder einer der niedrigen Obeschwingung einer bestimmten Note haben geschehen. WofÃ¼r sind die "Live" und "Studio" Schalter in Workbench wenn ich eine Variax Acoustic 700 benutze? Der Live Modus entfernt die Raum-Reflektionen aus dem Gitarrenausgang. Ich habe seltsame Textzeichen in meinem Titel. Warum? Auf dem Mac sind Option 1 und Option 2 TastenanschlÃ¤ge fÃ¼r Sonderzeichen. Da diese Funktion in die Schriftarten eingebaut ist, kÃ¶nnen wir diese nicht abschalten. Dies geschieht jedoch nur, wenn ein Insert Point in einem der Textfelder ausgewÃ¤hlt ist somit kÃ¶nnen Sie dieses Problem einfach umgehen, indem Sie eines der Body, Pickup oder Tone Menus anklicken (je nachdem in welchen Tab Sie sich befinden) und dort den Insert Point aus dem Textfeld entfernen. Wenn Sie aber ein Modell nicht sofort auf ein anderes ziehen, sonder zwischen zwei Modellen, dann fÃ¼gt es sich selbst zwischen beiden Modelle ein und rutscht alle unteren Modelle einen Platz nach unten. Verrutschte Modelle werden dann als "Edited" angezeigt (gelbes Aurufezeichen daneben). Wenn Sie diese Anordnung wirklich haben wollen, fÃ¼hren Sie eine Synchronisation durch indem Sie aud "Write Selected Models..." klicken, ansonsten kÃ¶nnen Ihre Ã„nderungen verloren gehen. Achtung, dies funktioniert nur fÃ¼r eine Bank obwohl Sie auch die Swap Funktion benutzen kÃ¶nnen um ein Modell von einer auf eine andere bank verschieben kÃ¶nnen. Wenn Sie mehrere Modelle aus dem Device Browser in ein Bundle oder eine Collection im File Browser verschieben wollen, wird dieser sich unterschiedlich verhalten je nachdem wie Sie die Auswahl tÃ¤tigen. Eine "Shift-Klick" Auswahl wird die Modelle in der Reihenfolge verschieben, wie Sie im Speicher sind. "Strg-Klick" (oder "Command-Klick" fÃ¼r Mac) wird die Modelle inder Reihenfolge ablegen in der Sie die einzelnen Modelle angeklickt haben. Z.B. : wenn Sie Strg-Klick gemacht haben auf Spank 1, Spank 3, Lester 4 und Reso 3 und wollen dann nocheinmal zurÃ¼ck um Lester 2 zu kopieren, dann werden diese in genau dieser Reihenfolge in das Bundle bzw. die Collection abgespeichert und nicht in der Reihenfolge, wie sie im Device Browser abgespeichert waren. Wenn Sie ein Modell von einer Bank auf den Namen der Bank ziehen, wird das Modell auf die letzte Position gelegt und alle anderen Modelle wandern ein nach oben. Wird die Grafik der Variax Workbench sich bei einer LinkshÃ¤nder-Gitarre auch verÃ¤ndern? Nein, die Grafik wird nicht herumgedreht. Die E Saite wird so z.B. auch weiter der E Saite auf dem Bildschirm entsprechen. Welche Sind die Begriffe dich in kennen muss in Verbindung mit der Line 6 Workbench? Bundle: Eine abgespeichert Ablage des gesamten Speichers der Variax. Dies beinhaltet Modelle, sowie Banken und Schalterkonfigurationen. Collection: Eine abgespeicherte Gruppe von Modellen. Collectionen kÃ¶nnen von jeder GrÃ¶ÃŸe sein und beinhalten interne Ordner fÃ¼r die Organisierung. Modelle die in Collections abgespeichert sind beinhalten keine Schalter-/Bankeninformationen. Was ist der Unterschied zwischen Collection und Bundle? Ein Bundle ist immer eine Ablage des vollstÃ¤ndigen Speicherinhalts der Variax. Dies beinhaltet die Speicherpositinen der Modelle (oder Schalterpositionen). Es wird immer genau 12 Banken an jeweils 5 Modellen haben, also ins Gesamt 60 Modelle. Wenn Sie Ihre Variax klonen wollen, benutzen Sie einfach den "Get Bundle" Knopf auf Ihrer Gitarre und dann den "Send Bundle" Knopf sobald die andere Gitarre, auf die geklont werden soll, angeschlossen ist. Eine Collection ist eine Sammlung aller Ihrer Modelle zusammen abgespeichert. Das kann sowaohl ein einzelnes sowohl als auch zwei oder tausende Modelle sein. Innerhalb dieser Sammlung kÃ¶nnen Sie TÃ¶ne in verschiedene Ordner unterteilen um diese zu organisieren. Eine Collection kann soviele Ordner haben wie Sie wollen (obwohl Sie keine Unterordner erstellen kÃ¶nnen). Dies ist der perfekte Weg um viele verschiedene Modelle zu kategorisieren und so Ãœberblick zu behalten. Edit Buffer: Dies ist der Ort im Speicher Ihrer Variax an dem ein Modell geladen wird, wenn Sie aus von der Gitarre aus auswÃ¤hlen oder in einem der Browser doppelklicken. Wenn Sie ein Modell in Workbench bearbeiten sind Sie eigentlich nur an einer Kopie dieses Modells am arbeiten, welches auf der Gitarre abgelegt ist. Wenn Sie sich also dazu entscheiden die Ã„nderung zu verwerfen, kÃ¶nnen Sie einfach zurÃ¼ck gehen ohne, das irgendetwas Ã¼berschrieben wurde. Dies bedeutet jedoch auch, dass wenn Sie Ihre Ã„nderung behalten wollen, nicht vergessen dÃ¼rfen diese abzuspeichern. Edit Window: In diesem Fenster kontrollieren Sie Body, Pickup, Tone/Volume und Tuning um Ihr eigenes individuelles Variax Modell zu entwerfen. Das Edit Fenster hat drei Tabs (Body, Pickup und Controls), eine Tuning Sektion unten und eine grafische Representation der Gitarre. Hier kÃ¶nnen Sie auÃŸerdem Pickups auswÃ¤hlen, diese drehen und verschieben wie es Ihnen gefÃ¤llt. File Browser: Die linke Seite des Tone Locker Fensters. Hier werden alle Modelle, Collections und Bundles, die Sie abgespeichert haben angezeigt. Model: Eine bestimmte Kombination von Body, Pickups, Tone Controls und Tuning. Swap Buffer: Dies lÃ¤dt des Modell auf die Gitarre, von dem aus Sie die Bearbeitung gestartet haben. Mit diesem Knopf kÃ¶nnen Sie schnell und einfach zwischen dem was Sie erstellt haben und dem womit Sie angefangen haben wechseln. Dies ist ein guter Weg um zu Ã¼berprÃ¼fen ob Sie mit Ihrer Bearbeitung auf dem richtigen Weg sind. Achtung, wenn Sie ein Modell speichern, dann wird immer das Modell abgespeichert, welches Sie ausgewÃ¤hlt haben. Also stellen Sie sicher, dass Sie auf dem korrekten Modell sind. Sync: Dieser Knopf erlaubt es Ihnen den Device Brwoser mit dem Speicher Ihrer Variax zu synchronisieren. AuÃŸerdem gibt es Ihnen die MÃ¶glichkeit zurÃ¼ck zu den abgespeicherten Modellen zu springen. Tone Locker: Dieses Fenster beinhaltet beide Browser (File und Device) und hierhin gehen Sie zur Verwaltung Ihrer Dateien, zur Modell Organisierung und um Modelle im Speicher zu tauschen. Ich bekomme MIDI ZeitÃ¼berschreitungen (timeouts) und/oder Verbindungsfehler wenn ich Workbench starte. Wie kann ich dies beheben? SchlieÃŸen Sie Line 6 Monkey bevor Sie Workbench starten. Laden Sie sich die neuste Line 6 Software, wie Monkey und Workbench sowie alle Treiber von der Line 6 Webseite herunter und installieren Sie diese. Entfernen Sie alle nicht benÃ¶tigten USB GerÃ¤te von Ihrem Computer und stecken Sie das Line 6 GerÃ¤t direkt hinten in Ihren Computer ein. Wenn Sie einen Laptop benutzen sollten Sie alle USB Ports ausprobieren. Testen Sie es mit einem anderen Variax und USB Kabel sowie mit einer anderen Line 6 Schnittstelle um zu sehen ob es ein Problem mit dem VerstÃ¤rker gibt. Ich bekomme einen "Java Error" wenn ich Workbench starte. Was ist das Problem? Diese Version beinhaltet eine Behebung von einem KompatibilitÃ¤tsproblem mit Java, welches potentiell manche Betriebssytem/Hardware Konfigurationen betroffen haben kÃ¶nnte. Wenn Sie das X3 benutzen um Modelle zu wechseln, kann es sein das die Software nicht mehr mit der Hardware synchron ist. Benutzen Sie bitte entweder die Variax Workbench Software oder Variax selbst fÃ¼r die Modell- und Parameterauswahl. Das trennen der USB-Verbindung wÃ¤hrend Sie Workbench starten kann dazu fÃ¼hren, dass sich das Programm aufhÃ¤ngt bzw., kann zu Schwierigkeiten mit dem SchlieÃŸen des Programmes fÃ¼hren. SchlieÃŸen Sie bitte Workbench bevor Sie das USB Kabel entfernen. Das Austauschen der Gitarren wÃ¤hren Workbench lÃ¤uft kann zu Kommunikationsverlust fÃ¼hren. Bitte schlieÃŸen Sie Workbench bevor Sie Gitarren wechseln und starten Sie es dann neu. Wenn Sie das X3 Live benutzten (Presets Ã¤ndern, Select Knopf benutzen,...) wÃ¤hrend Workbench startet, kann zu MIDI ZeitÃ¼berschreitungen fÃ¼hren. Bitte lassen Sie Workbench erst vollstÃ¤ndig starten bevor Sie mit dem X3 Live arbeiten.